UKIP has admitted it is "lagging" behind with women voters and that the party sometimes resembles a "rugby club on tour". In a bid to reach out to women, UKIP's deputy chairman Suzanne Evans and Euro MP Diane James set out policies on maternity leave and childcare. Ms Evans blamed their lower ratings among women on the "lies" put out by other parties. She said the "propaganda" had "hit very hard and hit very deep". Ms James - who is UKIP MEP for South-East England - announced that the party gave its "absolute full support" to current maternity and paternity rights. On a personal note, Ms James said she didn't have a family, calling it "one of my biggest regrets in life". But she had "an enormous amount of sympathy" for parents facing "excessive increases in childcare costs" and UKIP wanted to cut those costs. She also announced that UKIP would remove VAT on sanitary products. "You might grin at this one," she told journalists, but it's "something that I feel very strongly about". She blamed the European Union for classifying sanitary products as luxury items, saying: "I cannot believe that the European Union sees it appropriate to penalise women in that instance." Former UKIP MEP Godfrey Bloom was thrown out of the party after joking that party activists were "sluts". 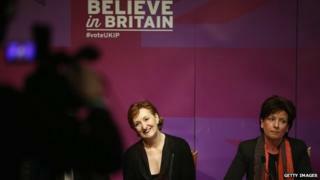 Ms Evans said he "wasn't the kind of person" that UKIP wanted. "There is this myth put about that we will scrap maternity leave, that we hate women, that we don't anything for women." She added: "The depth of the propaganda that the other parties have put about on this has hit very hard and hit very deep." Also at the press conference was UKIP's economics spokesman, Patrick O'Flynn, who wanted to be "slightly more self-critical". "I think Nigel himself has said sometimes UKIP resembles a rugby club on tour. I think that is becoming less and less true." He felt UKIP had to work harder and there were still occasions when men in the party had "occasionally resorted to boorishness or chauvinism". "There is no reason we should be lagging with women voters. We still are." Ms Evans was also tackled on Nigel Farage reportedly saying that mothers breastfeeding in public could "perhaps sit in the corner". She rejected the reported version of the comments and said: "I breastfed in public for goodness sake. I don't have a problem with it at all. It is a natural thing." BBC Daily Politics presenter Andrew Neil suggested that the problem with the set collapsing at the start of the press conference was symbolic of a a campaign "regarded generally as a shambles" with UKIP "fast becoming an irrelevance". Mr O'Flynn rejected that suggestion and said that he thought the party's national poll rating was "holding up well".